With the help of advanced algorithms based on neural networks this revolutionary software will predict baseball (MLB) game results with great accuracy! - Incredibly simple to use! - 100% automatic, no need to enter any data! - Gives you the best recommendations for the day, Money Line, Run Line or Over/Under! - Updated for MLB 2010 season ! Program predicts baseball (MLB) game results with great accuracy! - Gives you the best recommendations for the day, Outright winner, Asian Handicap and Over/Under! - Analyzes current MLB game odds! - Learns from recent results and from database with 10 years of statistical information! - Tons of variables are analyzed in just a few minutes! - Enter the world of professional sports handicapping with this powerful software! - Baseball predictor is like having a powerful baseball bat and an invaluable baseball card! Supports: All MLB 2011 season including the world series! Profit from all Baseball action!!! The best Baseball Predictions !!! Check out our other sports predictors for American Football, Basketball, Greyhounds, Horse Racing, Ice Hockey, Soccer and Tennis ! Count down to baseball game or tournament. Baseball Free Screensaver. Photos slideshow. Solves forecasting and estimation problems in Microsoft Excel. Baseball coaches track your baseball team's roster from game to game. OOTP 9 is an award-winning baseball management simulation. Try the free demo! This is your chance to get some baseball training. Baccarat system will prove its baccarat strategy works. Win 2 of 3 casino shoes. Baccarat system for Online Casinos - 100 FREE predictions. Advanced scorekeeping system for baseball. Hundreds of stats and reports. Pregnancy weeks calculating women menstruation & predict safe periods. 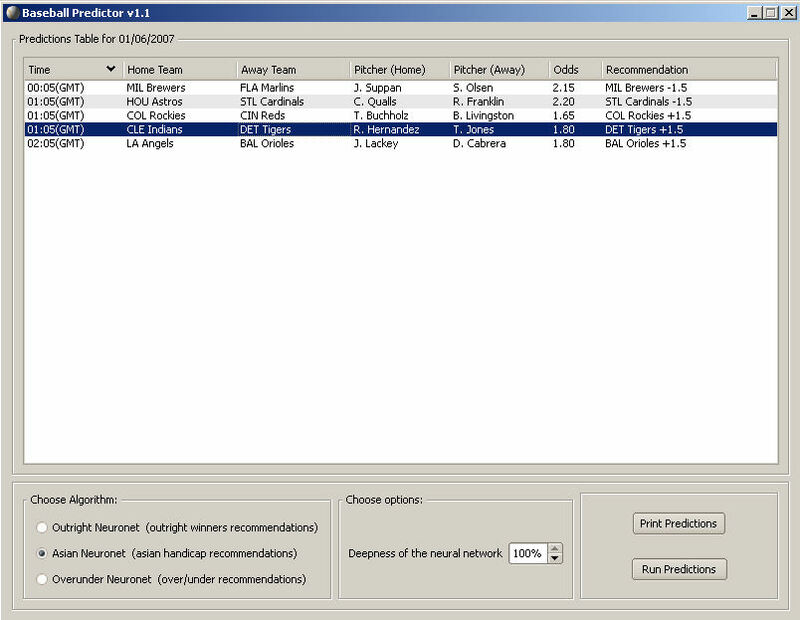 Qweas is providing links to Baseball Predictor 1.5 as a courtesy, and makes no representations regarding Baseball Predictor or any other applications or any information related thereto. Any questions, complaints or claims regarding this application Baseball Predictor 1.5 must be directed to the appropriate software vendor. You may click the publisher link of Baseball Predictor on the top of this page to get more details about the vendor.